How to choose the right islands for you! We admit it, we're big fans of Greek Island Hopping, and after years and years of doing our own research, we've learned a thing or two about doing it right. Since there are hundreds of islands worth considering, you need to have a plan, unless you have all the time in the world to wander, as did Odysseus before you. Of course, in order to make your Greek Island Hopping plan, you have to be a bit organized as well, and you must know how to get from A to B to C. But, don't worry if this all sounds a bit daunting, we've made it easy for you ... we've compiled a menu of 54 different combinations lasting from 15 days to a simple 4-day escape. We've taken into consideration that you all have different interests, and that any single Greek Island Hopping package has to appeal to a variety of those interests, whether it be a couple, a small family, or a group of friends, or club members traveling together. The wonderful aspect of Greek Island Hopping is that the islands have so much to offer and so much variety that everyone will get to do their own thing! While the museum lover is off poking his or her nose into antiquities (and we have a lot of them! ), the beach lover can lounge around all day soaking up the sun (we have a lot of that too! ), and splashing around in the most crystal-clear water on the planet (and yes, we have that in abundance as well!). For us, Greek Island Hopping can also include an island program combined with a cruise, or a mainland tour of the archaeological sites. For instance, if history, archaeology and antiquities are your passions, then Delphi, Epidauros and Olympia on the mainland make an outstanding combination with Delos (available in any package that includes Mykonos), and Ephessus is a highlight of our eastern Aegean cruises. Our Kalypso package combines them all! 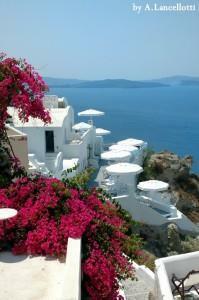 Even a cruise on its own is Greek Island Hopping ... you simply stay put, and let the ship do the hopping for you! If you think that Greek Island Hopping is the ideal vacation for you ... and we certainly think that it is ... just take a look through our suggestions. You're sure to find exactly the right combination that includes all of your individual interests in one complete Greek Island Hopping package.